» How can you setup and synchronize your Google Mail account in Outlook 2016? How can you setup and synchronize your Google Mail account in Outlook 2016? I use Google Mail for my personal correspondence on a daily basis, but spend much of my day in Microsoft Outlook as i use it for business purposes. Is there a way for me to add my Google Mail account into Outlook, so i can more easily stay connected with friends and family while at work? Thanks for your question. It’s possible to setup Gmail, as well as Outlook.com and Yahoo Mail on Outlook. For practical purposes, we’ll use Outlook 2016 in this tutorial. But the process is pretty much identical in Office 2013 and 2010. In Outlook 2016, Go to File and Click on Add Account. In the dialog box, select Manual setup or additional server type and click Next. Click Pop or Imap and select Next. Enter the User information and Logon information of your’s. 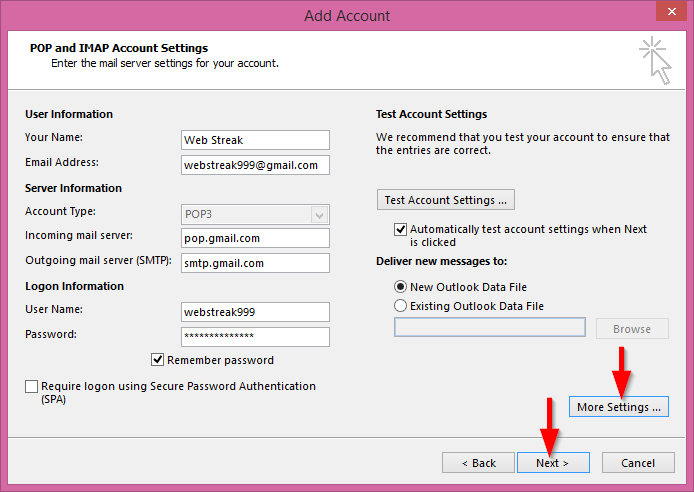 Select the Account type as POP3. In the Incoming and Outgoing mail server type pop.gmail.com and smtp.gmail.com. Click on More settings, select Advance and type the text from the picture below accordingly. Click OK, select Next to Log onto Incoming mail server and to send a test message. After tests completed successfully, click Close to add your Gmail account to Outlook 2016. Voi’la, you have just setup and sync your Gmail account for usage and sync in Outlook 2016. Got additional related questions on Office and Outlook? Look into our guide on how to get your questions answered. Log onto incoming mail server (IMAP): The server refused the connection. Screen shots are not the same as what I get on Outlook 2016. These look like either 2013 or Office 365 Outlook.